The man who would become Octopus is actually a lot older than he appears, having served as something of a mentor to Antonio Seghetti when he was growing up. Antonio Seghetti would eventually grow up to become the brutal OverLord, leader and founder of the Vicious Circle. Octopus grew frustrated with the method of leadership employed by OverLord and set about working with his fellow scientist, OpenFace, on finding a way of removing him from power. The duo broke into the main warehouse of Donner Electronics in search of a device that could grant them command over CyberFace, recently resurrected by the United States government’s Project: Born Again. Although OpenFace was taken into custody, Octopus managed to avoid arrest and eventually located and enslaved CyberFace. Dragon tried to locate the elusive villain but it was not until Howard Niseman got abducted after getting too close to Octopus that Dragon could finally confront his prey. Octopus was arrested, sitting in jail as the Vicious Circle launched a failed assassination attempt on the similarly locked up CyberFace. Octopus remained locked up in Stronghold Penitentiary until Alex Wilde and Howard Niseman sought his assistance in taking out CyberFace. The villain had seized control of Chicago following the Martian invasion and it was thought that Octopus could bring him under control once more. Instead, Octopus broke free whilst in transport; coming across CyberFace’s severed head (blown free from his body when Dragon struck his dangerously unstable body). The head of CyberFace was grafted to BrainiApe’s gorilla body in order to revive the villain. Octopus then joined forces with PowerHouse (and later OpenFace and Baby Boom) to form a rebellion to Horde’s rule over the Vicious Circle. They forced Dragon into eliminating their rival under threat of Alex Wilde’s murder. CyberFace was killed for good by Hitler’s Brain, leading ultimately to the rebirth of both BrainiApe and OverLord. 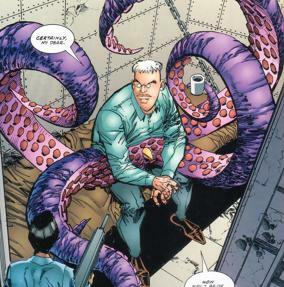 In the reality that Dragon ended up in after his confrontation with Damien DarkLord, Octopus had been one of those villains that refused to pledge loyalty to CyberFace. This rebel faction of the Vicious Circle joined Dragon’s rebellion against the King of the World, only for them to be apprehended by the new Liberty League.